5 August 2013 - Richmond, VA - The Virginia Tour gathered to contest its final tournament of the 2013 season, the 108-hole VA State Championship, on historic course # 3 at the beautiful Richmond, VA Putt-Putt Fun Center. A field of 17 professionals and 16 amateurs vied for the fourth and final major championship title to be awarded for the season on the VA Tour. The VA Tour Doubles Championship, making its return to the VA Tour schedule for the first time since 2003, was held concurrently with the VA State Championship tournament. 2010 PPA National Champion Greg Newport continued his recent dominance of Richmond's course # 3, as he captured his astounding sixth-consecutive victory on the course with a four-stroke triumph in the VA State Championship. Newport earned an added bonus with his stellar play, as he and his partner Rick Rybaczek notched a two-stroke win in the VA Tour Doubles Championship. Action began in the professional division amid relatively benign early-morning weather conditions. Newport's march to glory commenced rather inauspiciously, as he stood mired in a three-way tie for 10th place, four strokes behind first-round co-leaders PPA Hall of Fame legend Daryl Freeman and 2007 PPA National Champion Rick Baird, after posting a lackluster opening-round 26. Newport rebounded with a dazzling second-round 22 to move into a two-way tie for fifth position with a 36-hole total of 48, two strokes behind second-round co-leaders reigning VA Putting Classic Champion Jeff Spainhour and Richmond local stalwart Manfred Stewart. 2012 PPA Southern Open Champion Danny McCaslin established the lead at 70 at the tournament's midway point by virtue of a magnificent third-round 22. Newport carded a third-round 23 to join Stewart in a tie for second place at 71 heading into the afternoon session. After a short lunch intermission, players were re-paired and teed off in the fourth round in inverted order according to their 54-hole scores. Tricky swirling, intermittent afternoon winds may have contributed to a spike in the fourth-round scores recorded by most of the contenders. Despite shooting only a pedestrian fourth-round 26, Newport surged into the lead with a 72-hole total of 97, one stroke ahead of McCaslin, Spainhour, and Stewart. With a fifth-round 24, Newport increased his advantage to two shots with a five-round score of 121, placing him two strokes ahead of Spainhour and three in front of McCaslin. A solid final-round 24 allowed Newport to waltz to a rather easy four-stroke victory with a 108-hole total of 145. In the process, Newport notched his third-career VA State Championship title and garnered the $400.00 winner's check. McCaslin settled for runner-up honors at 149 after a closing-round 25. A two-way third-place tie at 150 included Spainhour and Monroeville, PA Mt. Rushmore standout Ken Hastings, who climbed up the final leaderboard after authoring a brilliant tournament-low sixth-round 21. Rybaczek mounted an inspired afternoon charge to join Stewart in a tie for fifth position at 151. The VA Tour Doubles Championship was held concurrently with the VA State Championship. The better nine-hole score of the two doubles partners was counted for each of the nines played in the event to produce a 108-hole team doubles score. In a tightly-contested battle, Newport and Rybaczek ascended into sole possession of the lead after five rounds and ultimately emerged victorious with a 108-hole team total of 139. The squad of Baird and reigning PPA Western Open Champion Thomas Rawles finished second at 141. At 144, fourth-round co-leaders McCaslin and Stewart completed the event in third place. In the amateur division, two-time APA National Doubles Champion Malcolm Shumaker orchestrated an impressive performance en route to a wire-to-wire three-shot triumph. With rounds of 23, 23, 24, 24, 26, and 24 for a 108-hole total of 144, Shumaker held off a pesky Conway Coffey to earn his third-career VA APA State Championship title and in the process beat the entire professional field. Coffey, who earned amateur division low round honors for the event with a third-round 22, tied Shumaker with one round remaining, but a closing-round 27 dropped him into second place at 147. At 149, steadily-playing reigning Dogwood Open APA Champion John Petrie finished third. 2007 APA National Player of the Year Dennis Biesma manufactured stellar finishing rounds of 23 and 24 to pole-vault into a fourth-place tie at 156 with 2009 VA Open APA Champion Terry Sanner. The final of the ten amateur division expense reimbursement spots awarded in the tournament fell at a six-round score of 164. As in the professional division, the VA Tour APA Doubles Championship was run concurrently with the VA APA State Championship, with the better nine-hole score of the two doubles partners being counted for each of the nines played in the tournament to produce a 108-hole team doubles score. With a final-round team score of 24, the duo of Shumaker and two-time APA National Champion Clayton Craft, Esq. broke a three-way logjam atop the 90-hole leaderboard to notch a two-stroke win with a 108-hole team total of 144. The father-and-son tandem of Bill and John Petrie posted a final-round team score of 26 to finish in second place at 146. At 147, Coffey and Lynchburg compatriot Wade Driskill completed the event in third position. Several season-long honors were finalized in the professional and amateur divisions at the conclusion of the VA State Championship tournament. In the professional division, Jeff Spainhour capped off an outstanding 2013 season by earning his first-career VA Tour Player of the Year Award. Additionally, Spainhour captured the tour's Low Stroke Average Award for the year. Pharmacist-to-be John Petrie garnered the VA Tour APA Player of the Year and Low Stroke Average Awards based on his solid and consistent performance throughout the season. Prior to the commencement of play in the VA State Championship, players voted for the 2014 VA Tour Committee and for the professional and amateur division 2013 Sportsmanship Award winners. Gary Hinshaw remained as permanent VA Tour Committee chairperson. Professionals Rick Baird, Bill Baus, Daryl Freeman, Brad Lebo, Rick Rybaczek, and Jeff Spainhour and amateurs Clayton Craft and Bill Petrie were elected as 2014 VA Tour Committee members. The tour membership voted Rick Shelton and Clayton Craft as well-deserved 2013 Sportsmanship Award recipients in the professional and amateur divisions, respectively. 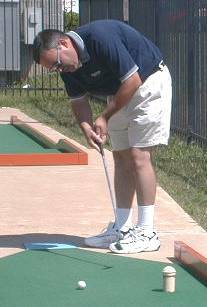 The Virginia Tour membership would like to extend thanks to host professional and course manager Gary Hinshaw, his wife Patsy, and their staff for welcoming the tour to their immaculately-maintained Richmond, VA Putt-Putt Fun Center and hosting a weekend of very successful tournaments. Their hospitality and efforts in maintaining the course in ideal playing condition as always were appreciated greatly by the tour players. The 2013 VA Tour schedule concluded with the completion of the VA State Championship event.